The Intelsat 3 spacecraft were used to relay commercial global telecommunications including live TV. Three of the 8 satellites in the series (F1, F5, F8) were unusable due to launch vehicle failures, and most of the remainder did not achieve their desired lifetimes. F2 operated for 1.5 years, F3 was partially operational for 7 years, F4 lasted 3 years, F6 survived 2 years, and F7 remained usable for 16 years. 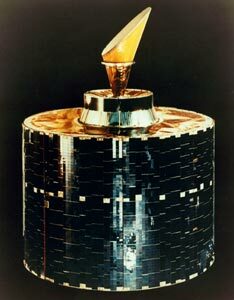 Intesat-3 spacecraft were spin stabilized with a despun antenna structure (34 inch tall antenna). Hydrazine propulsion system with 4 thrusters and 4 tanks. Passive thermal control. Body mounted solar cells produced 178 W peak, 9 AHr NiCd batteries. The payload consisted of two transponders using 12 Watt TWTA amplifiers for multiple access, 1500 voice circuits or 4 TV channels.